Aging and healthspan are growing areas of medical research. Understanding the aging process and the underlying mechanisms may help us combat age related diseases and potentially improve healthspan. Vium's platform with 24/7 non-invasive monitoring and recording of subjects in their home cage provides provides an ideal set-up for aging and healthspan studies. The collection of longitudinal digital measurements over the course of months and even years enables the investigation of changes in physiological parameters such as circadian rhythms, activity and breathing rates, across the entire lifespan of the subject. These types of studies are not possible to perform with such high precision using any other platform. In addition to the automated data collection, Vium also provides conventional assessments including longevity, body condition, body weight (automated in-cage weights in validation), and blood chemistry/hematology. Typical aging models use inbred mouse strains, such as C57Bl/6, or use 4-way and 8-way/Collaborative Cross animals. Vium can conduct studies using customer specified transgenic models and and can work with you to design a custom aging study. 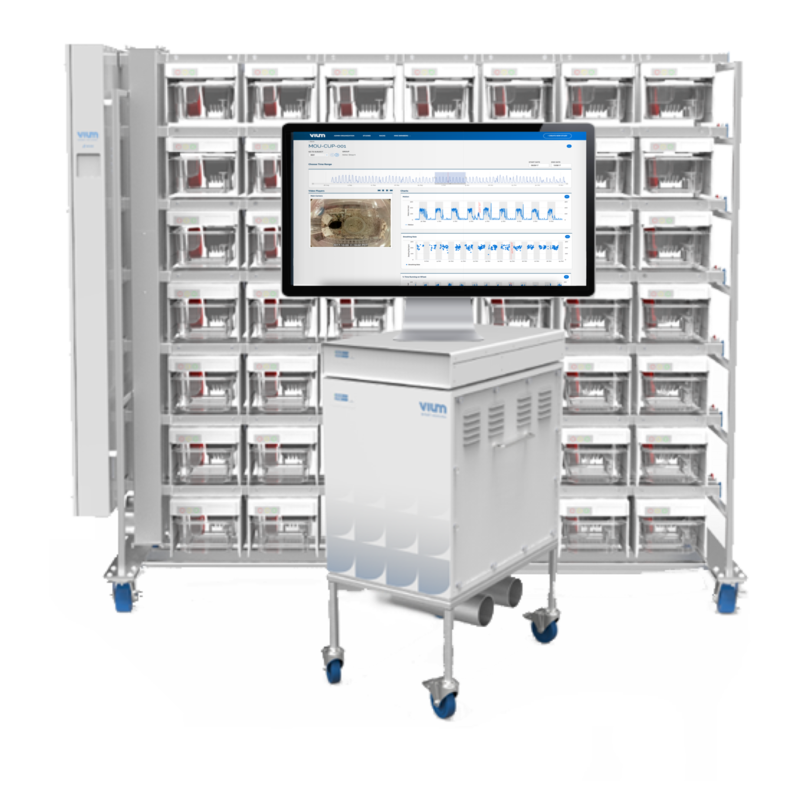 Vium's Motion biomarker tracks subject behavior in the smart cage and reports the average motion. This enables the tracking of average day-time and night-time activity as well as the tracking of age-related activity across the lifetime of study subjects (Figure 1). Subject motion can also be used to develop a circadian motion pattern using average night time and average day time motion. Plotting average day and night motion over time enables one to observe the differences in circadian motion based on subject age (Figure 2). Figure 1. Decrease in average night time motion was observed over the course of a year in female C57BL/6 mice in an aging study performed on the Vium research platform. Figure 2. Changes in Circadian motion over time in female C57BL/6 mice. Study shows the average night time activity deceased as the mice aged while the average daytime activity increased slightly.